Things are changing in the Civil Service. The changes might be hard to see from outside - you won't have heard about them on the news - but they are happening. And the pace of change is accelerating. Government is adopting new ideas and new ways of working to make everything we do better for users, and more efficient. Technology and the internet in particular, are the driving forces. Many in the world of business understood this and adapted to it years ago. The Civil Service lagged behind. Now we are changing that. And we all have to change – this is not something that is just affecting government. Global companies, start-ups and the wide range of small to medium businesses that make up the backbone of the British economy are addressing similar challenges across their businesses. This morning for example a group of digital leaders and permanent secretaries shared our experience with Meg Whitman and her top team at HP. The discussion indicated just how significant this agenda is and also – in my view – the good progress we have already made. 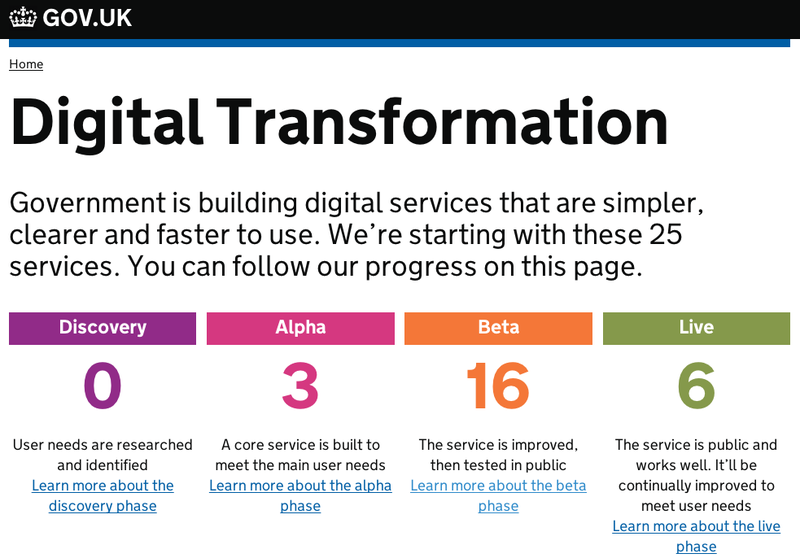 If you have not seen it before, take a look at the Transformation page on GOV.UK. It is called that for good reason. It shows how some of the biggest services the Civil Service runs are being transformed for the digital age. Services that let you register to vote, apply for Carer's Allowance, renew a patent, or book a prison visit - these are among the 6 services that have completed the transformation process and are now live. Many more are in what is known as beta phase. That means they are working services, but not yet ready to replace their predecessors that are either completely non-digital, or in some cases digital but not built in a user-centric way. We have established a clear standard that all transformed services have to meet: the Digital by Default Service Standard. To help civil service teams meet the standard, there's an online guide, the service manual. It's a summary of everything you need to know to design and manage a modern digital service. Like the services themselves, the manual is a living thing - it gets updated and changed as time goes on, and as we learn from our mistakes. We do not want to continue running government as a series of disjointed silos. A key element of our Civil Service Reform programme has been to create a more unified, efficient service. Instead, we are increasingly focusing on an idea called "Government as a platform". That means we build technology that is more open and more interconnected. If one department needs a service for publishing information to the web, so will other departments - so why should they all pay money to different people to achieve the same end? Why not just build a publishing platform they can all use and share? That's what GOV.UK is. It is not just a website, it’s a platform. We are building other platforms too. The Performance Platform captures data about how digital services doing. The GOV.UK Verify platform provides people with a way to prove who they are online, so they can use government services safely. A huge amount of work has been done already, but we have just scratched the surface of what's possible. Government collects huge quantities of data - if we open up that data via platforms and Application Programming Interfaces, external developers in the public and private sectors will be able to make imaginative use of it. New services will emerge – bespoke, personalised services government couldn't normally justify spending money on, especially in a tight budgetary environment or services no-one else has even thought of before. At the heart of all this change are the users: people who need to use government services, from the trivial to the life-changing. All these services, all the platforms, everything we build from now on should be focused on meeting user needs. I believe that thanks to the excellent work of the Government Digital Service and the increasing digital capability within each individual department, the British Civil Service is already at the cutting edge of applying digital technology to public service delivery. But we now need to take this to the next level, and apply the same principles and techniques in policy design. All of which explains why I am so pleased to have taken up the role of Head of the Civil Service. Change is good, change is exciting, and change is happening right now. I cannot wait to see what's next. It was nice to see the focus on "government as a platform". The concept of "information produced BY, and on behalf of, citizens" is such a hard one to get across. Perhaps we should revisit the original proposition for GOV.UK. https://www.gov.uk/government/publications/govuk-proposition It's still very much "us" on the inside publishing for "them" on the outer. Now that the GDS teams have broken the ice from the top-down, and started dismantling the walls between departmental silos, it would seem the right time to consider how citizens might be engaged in contributing to the platform(s). And developing a collaboration/engagement platform which can be shared by insiders and outsiders. So far developments have started at Stage 3. http://blogs.worldbank.org/ic4d/co-creation-of-government-services i.e. focus on a particular (central) service and make it more user friendly. This was the only way to break the ice, and the GDS teams have done well. Now, as the question of "who issues a citizen's IDA?" is addressed, we are beginning to focus on Stage 1. i.e. The personalization of services, and their prioritization, according to the majority of users, not (just) the economic demands of (2 levels of) government departments. We can all do without change. But it would be good to see more progress now, especially if we can include more citizens in defining their priorities. I can hardly wait either. Jeremy, what did Meg Whitman think of the Government's general move away from using big system integrators to using SMEs for delivery? "That’s what GOV.UK is. It is not just a website, it’s a platform." You say: " if we open up that data via platforms and Application Programming Interfaces, external developers in the public and private sectors will be able to make imaginative use of it"
But this is fundamental to any open platform. GOV.UK is a poor example to give. If GOV.UK was a platform it would have a supported read API so anyone can automatically access the data published on it. It does not have one. A recent post on the Inside GOV.UK blog makes it clear that this API will not happen any time soon and the current API remains unsupported and only covers a fraction of the content. Similarly, there is no write API for GOV.UK so I can't build a better tool to help publish onto GOV.UK. and instead everyone has to use the interface that GDS have built. The system has many limitations and 2 years on it still lacks things that popular opensource content management systems provide. That doesn't sound like a platform. Instead it is just a service that publishers in departments have to use. There is no alternative, and no way of building an alternative outside of the tight control of GDS. I hope this isn't the model for future Government services and platforms: to centralise everything into a service run by GDS with the promise that many years down the line it might become a platform? Fair point, Govt Web Developer. Perhaps we should go into a bit more detail. Internally GOV.UK uses APIs for itself, and we're gradually opening up write APIs to selected parts of government, enabling them to publish using their own tools and systems. The key point of the blog post written about APIs is that we're not doing them right now. Quite simply, other things on our todo list had higher priority, so we’ve done them first. But that doesn’t mean we’ve forgotten about them. And everything we have built so far has been built with the APIs of the future in mind. The word 'platform' can mean many things - in the case of GOV.UK it's currently a single platform for finding all government services and information. This has never existed in government before, and there are huge advantages to having all government publishing done in one place, not least of which is the potential for APIs for that information. There's also the consistency of user experience and navigation, ease of finding things, and the ability to join up formerly separate government services and content into single themed journeys. I work in the Governemnet Statistical Service and .GOV.UK is not fit for purpose for the publication of statistical products-its just basically (not a very good) library holding pdfs(or maybe the excel version of the pdf).I would be too bored from looking at the dropdown search lists to go any further.I can never find the products we publish very easily. Its not intuitive and its not fun.We need to be able to explore responsive interactive web technology(e.g graphs using SVG ) and we are not meeting users needs with our current setup .We are not meeting the dissemination standards required.We are behind the curve of our users' technology skills.All the evidence from other (European) statistical organisations which use interactive functionality have higher levels of user engagement . The new version of the ONS.GOV.UK site looks a lot better. 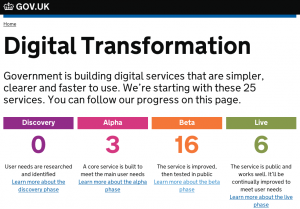 I agree the concept of a single platform of .gov.uk is a good one but the execution is not.